We take on custom projects from time to time, they test us, teach us and keep us at the top of our game. 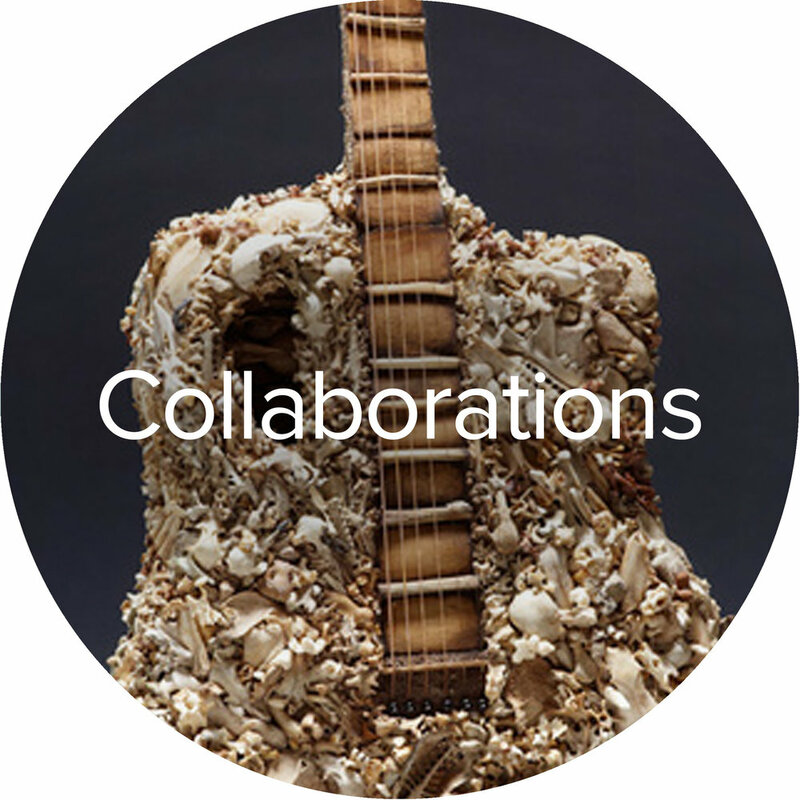 Occasionally we join in on collaborations too - a great way to be inspired by other artists. Have you got project that needs some input from the professionals? An idea for an instrument but not sure how to do it yourself? Goldbeard can help, we have made some pretty cool guitars from some pretty strange items. We are not afraid of talking to other artists, crafts-people or musicians about a collaborative piece or project. Past experience collaborating with others has shown that it can inspire and reward us all. Choice Bros - Wellington brewers of note known for their innovative, experimental and occasional mad beers. The beers created by the Bros have both broadened horizons and delighted many a beer fan. Designtree - Innovative furniture and lighting for homes and businesses, Tim Wigmore and Rebecca Asquith create masterpieces of design in Lyall Bay, Wellington. Jean Burgers Jewellery - Creator of intricate wearable artworks influenced by Sacred Geometry, ancient symbols and patterns from her homeland New Zealand. Jean aims is to create unique talismanic artifacts, imbued with symbolism. Southern Cross Flutes - Hand made North American style flutes of the highest quality and craftsmanship. This stunningly detailed craft was learned in America but now made right here in New Zealand by Todd Chaplin. Red Witch Pedals - Analog guitar effects pedals that strive to blend art and technology to create sonically and visually unique effects of the highest order. Tukituki Instruments - Revitalising the traditional Cajon hand drum with innovative ideas and vast musical experience, Wellington maker Phil Jones brings his extended travels and musicianship into crafting Cajon drums. Tubs Audio - Impeccably conceived, designed and tested, these audio speakers show the competition what the real bench mark in sound reproduction is - made in Wellington, showcased across the world. Three March Hares - Stunning contemporary jewellery hand-made by experienced artisan Su Keates in Owhiro Bay, Wellington. The Rolling Mill - Award winning jeweller Nick Hensman offers an adventurous take on a traditional craft.